Gillen maxi giant t lights. Sold singly these are the same as our Giant Maxi T Lights (product Code 358) but with glitter. Base colour white only. 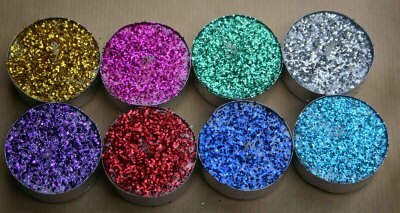 Choose glitter colour from drop down price. Approx size each cm diameter, burn time 10 hours approx. Sparkling glitter. *made to order item, candles are prone to shedding glitter, keep in packs until use to minimize shedding.